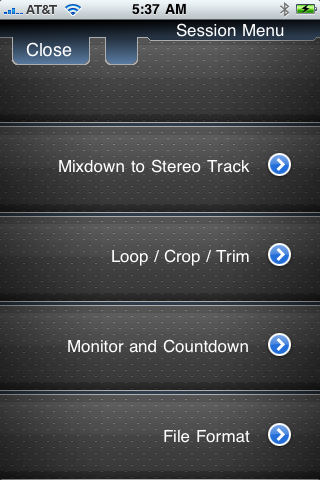 Mix all the tracks together into a single new stereo track. Mixdown uses the same pan and gain options that you set on the main view, so "what you hear is what you get". Live monitoring lets you listen to yourself in your headphones while you lay down a new track. Countdown is the time delay from when you hit the record button to when the recording starts. Set the exact file format that you want for any new recordings. Use this if you want to save space on your iPhone, or if you want better quality or need a specific file type for compatability with desktop applications.